This month, students in all 6 Dexter schools were able to try locally grown lettuce from Zilke Vegetable Farm in Milan, MI. 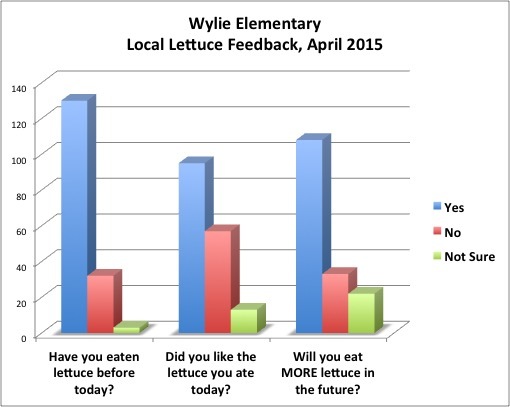 At Wylie Elementary, students tried samples of the lettuce straight from the farmer herself. A week later, the lettuce was ready to be harvested and delivered to the schools. The questions we asked students this month were a little different than surveys in the past, when we mostly focused on students’ immediate reactions to what they tasted. This time, we wanted to know what students might do in the future, as a result of their experience with local food in their cafeteria. Interestingly, the data show this month that more students reported they would “eat more lettuce in the future” than students who reported that they liked the local lettuce they ate during the event. Next, students will eat locally grown asparagus for lunch, mostly likely during the last week of May. Happy spring harvesting!